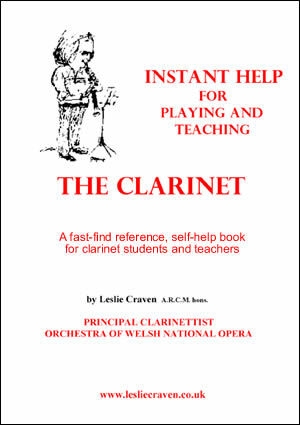 Leslie’s book, Instant help for Playing and Teaching The Clarinet, has been so successful he has sold all the hard copies from the first print run – to enable customers to save money it is now downloadable exclusively as a P.D.F. document that can be stored and printed out when required either whole or in the relevant parts that the pupil/teacher requires – thus eliminating the need to carry the entire book around when just a few pages are needed to address a specific problem. Acrobat® Reader® is required to read the document. “This book presents information in bite-sized snippets, employing a simple but effective vocabulary which embraces specialist and non-specialist students and teachers alike. There are many tutor books on the market whose collective aim is to cater for all levels of clarinet playing. Some focus on the basics of clarinet playing whilst others focus on articulation or passage work. The vast majority of these texts assume that the student has a solid grasp on the fundamentals of clarinet technique. Having encountered many problems with my clarinet playing, I bought a range of books in the hope that with each new purchase, I would be able to articulate faster, or have greater finger co-ordination. None (until I read Leslie’s book recently) have helped in any great measure. My attention was first drawn to this book in November 2002, when I had a consultation with Leslie in his studio. At the end of the session, I was fortunate to be given an extract of this book containing information on embouchure (incidentally, some extracts are available free at www.lesliecraven.co.uk – click on downloads). Since then, I have eagerly awaited the arrival of this book through my letterbox. The information it contains reflects the vast experience the author has acquired through his many years as a freelance clarinettist, tutor at the Royal Welsh Colege of Music and Drama and Principal Clarinet with the Welsh National Opera. Section one focuses on the mechanical aspects of the instrument, and looks at issues such as maintenance, emergency repairs, reed making and adjusting. Section two helps the reader develop good practice, as well as highlighting many of the ‘bad’ habits formed by beginners. Thankfully the author offers the teacher/student solutions to these problems by means of clear diagrams and explanations. Section three critically examines the embouchure, ‘blowing’ and articulation, and provides the reader with a vastly detailed yet easily assimilated analysis, into what happens when we ‘blow’. One potential risk with such a book is that the information could be pitched at a level where only the intelligensia can understand. Fortunately this book presents information in bite-sized snippets, employing a simple but effective vocabulary which embraces specialist and non-specialist students and teachers alike. There are many colour diagrams used througout as a means of reinforcing the information, and these act as a simple yet effective accompaniment to the text which is succinct and often delivered with the author’s (in)famous wit. Whether you are a specialist or non-specialist teacher, professional or amateur clarinettist I encourage you to at least check the excerpts on Leslie’s website. I firmly believe that you will be impressed by the clarity of the information. For those of you that follow up your initial expression of interest with a purchase, I am sure that this particular text will become an integral and valued addition to your clarinet literature.